Treasure chests are difficult to resist. They come in all shapes and sizes, more times than not offering the potential for greatness–gold, armor, weapons, whatever. Most people don’t leave behind rotten vegetables in their fancy treasure boxes, and so you are more or less guaranteed to walk away a richer player. Unless that treasure chest is actually a mimic in disguise, and then you’re thrown for a loop, battling with what once held your dreams of a new item or chunk of change to make a down payment on that fancy, street-side abode back in the hub city. Real quick, some history. Mimics took shape back in the good ol’ days of pen and paper roleplaying, which I enjoy from time to time, but I’m more visual despite having a decent enough imagination, preferring Talisman or Descent. Mimics are a type of fictional monster, initially birthed in Dungeons & Dragons. They are portrayed as being able to change their shape to disguise themselves as an inanimate objects, most commonly as treasure chests. Mimics also have a powerful adhesive that holds fast to whatever touches them, allowing the mimic to beat the creature with its powerful pseudopods. That latter characteristic did not seem to follow over with mimics as they transitioned into videogame enemy fodder. Over my years of gaming, I’ve crossed paths with a number of mimics, all of which I passionately hate. This is a list of some. Forward, with the disgust! Here is a mimic treasure chest from Final Fantasy IX that I passionately hate. Here is a mimic treasure chest from Dragon Quest VIII: Journey of the Cursed King, called a cannibox and originally introduced in Dragon Quest III, that I passionately hate. Here is a mimic treasure chest from Rogue Galaxy that I passionately hate. Look at that nasty blue tongue. Here are mimic treasure chests from Rogue Legacy that I passionately hate. Here is a mimic treasure chest from Chrono Cross that wants to punch me. I passionately hate it. Here is a mimic treasure chest from Wild Arms 3 that I passionately hate. Here is a mimic treasure chest from Dark Cloud that I passionately hate. Here is a mimic treasure chest with a lot of teeth from Legend of Grimrock 2 that I passionately hate. Here is a level 60 killer mimic treasure chest from Borderlands 2 that I passionately hate. Shoot it in the glowing green part. Lastly, here is a mimic treasure chest from the original Suikoden, affectionately called a slot man, that I passionately hate. Have I missed any key mimics from some of your favorite roleplaying games? If so, let me know in the comments below. During my search, I came across a few screenshots of mimics in the Dark Souls series, which I’ve not yet played and am now feeling less inclined to deal with, but maybe they aren’t too tough to battle. Ha, that’s a joke. From what I understand, they are brutal. I finally got around to trying out that free and standalone-like 3DS demo for Bravely Default: Flying Fairy last night, but this post is not going to be explicably about that game. I need more time with it to both figure out my thoughts and overall opinions, as well as to decide on whether or not I’ll pick up the full retail copy, which drops today. I suspect I will, whether I love or loathe the demo to pieces, because these kind of strange JRPGs are far and few between, and my thinking is that by supporting it with a purchase, I’m helping to make strides towards a North American release for Fantasy Life. Wishful thinking, sure…but it’s better than doing nothing. But Bravely Default got me thinking about the various RPGs and JRPGs that really make you grind for levels and money from the very start, because, at least in the demo, it downright demands you do it. The very first fight outside of town resulted in one character in my party of four dead, two badly hurt and poisoned, and the remaining member okay at half of his HP. I’m on the default–pun intended–level of difficulty, and I’m pretty good at turn-based combat, but I don’t think I have the whole brave and default techniques down just yet. That said…yowzas. The combat is brutally tough, and so for my first hour and change with the demo, I’ve just been going back and forth to the inn to heal up, fight monsters in the desert, and rinse and repeat until my eyelids grow too heavy to keep playing. It’s honestly not terrible, as I’m used to grinding, but I always find it strange when a game makes it impossible to progress without it at the very beginning of the journey. Let me list a few other examples. 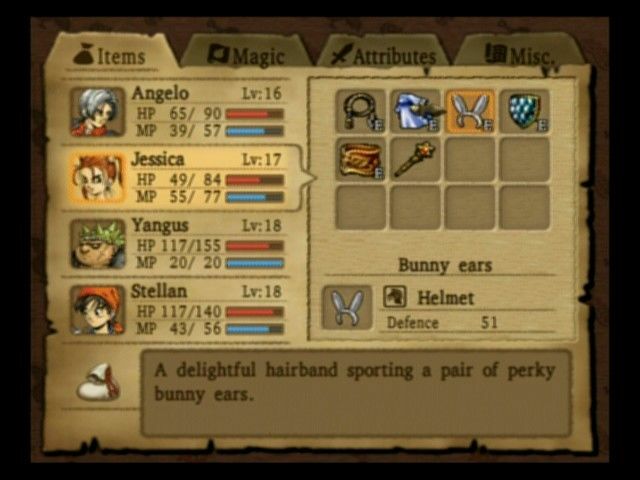 One of my fondest gaming memories, just in general, always comes back to Dragon Quest VIII: Journey of the Cursed King. See, when I moved out of my parents’ house and up to northern New Jersey for my newly acquired post-college job, I lived off the grid for several months, relying on previously purchased videogames and DVDs for nightly entertainment while I held off on getting cable and Internet. DQVIII filled that space greatly, but it’s a slow game, and you do have to grind for a little bit in the very beginning at the Waterfall Cave section, otherwise the final boss of that area can wipe your party out quite quickly. If I recall, there’s a small section of healing water you can keep drinking from to restore your team’s health, making this place perfect for grinding, and, at the time, it certainly seemed necessary. Dragon Fantasy (Book 1) is made up of three different storylines and a strange one-off inspired by all things Minecraft. Ignoring the latter and focusing on the former, of the three separate but connected plots, one storyline, by its very design, requires you to grind a whole bunch before you can even get to the first dungeon and safely explore it at a decent clip. In Ogden’s storyline, he is an old, washed-up man out to make a name for himself again, but that means fighting all the battles by himself, which is slower and more grindy than the other two campaigns. It meant fighting battles until Ogden was nearly out of health, run to the nearest inn, spend some gold to heal, and go back out to do it all over again. Not the most exciting time, but I ended up playing a lot of Dragon Fantasy (Book 1) while watching Netflix or Giant Bomb videos. The first hour or so of Ni no Kuni: Wrath of the White Witch is both magical and devastating, and not just because something terrible happens to Oliver’s mother. I’m talking about the area just outside the Golden Grove. It still gives me the shivers to this day. The monsters here are so powerful and aggressive that your small team of nobody really doesn’t stand a chance, and so you have two options: run and hope to avoid every fight, or go back into the woods and grind a bit for levels, money, and health-restoring items. Naturally, me being me, I ran for it. Which was not very successful for the first few attempts, though I did eventually get out of the area, only to find myself in an even more dangerous spot, though much more suited for grinding. Oh boy. Now, truthfully, I only stopped playing Phantasy Star II because the cold weather is here, and the Xbox 360 is in the living room, which gets no heat for the whole horrid season, and so it must wait until the snow melts before I can get back into it. And by it, I naturally mean grinding for levels and much-needed moolah while trying to figure out exactly where to go next. Thankfully, the music is so good that it makes grinding more pleasant than not, but it took me forever just to reach the first Bio-Systems Lab areas. Hey, remember Eternal Sonata? I sometimes do. Beautiful grass in that game, and it’s not every day you come across an RPG so heavily themed and dedicated to that theme. I mean, really…Polka is a terrible name for a young girl. But whatever. Every now and then, I think about going back and playing it some more. But that would mean starting over because I got to that ghost ship section and found myself severely under-leveled with no hope of gaining enough levels quick enough to defeat…uh, the boss Captain Dolce. From reading up some walkthroughs, it sounds like I messed up and didn’t spend enough time aimlessly grinding when I could. Oh well. I’m sure if I spent some more time looking through my collection I could come up with another five to ten RPGs that are grind-heavy early on, but I need to end this post somewhere. If you have one I missed talking about, let me know about it in the chat! That is, if you can spare some time away from your efficient, but meticulous level-gaining strategy. Of all the videogame-based alchemy systems, I can confidently say that I like the one in Ni no Kuni: Wrath of the White Witch the least. Which is a shame, as Level-5 generally knows what its doing with its item synthesizing mechanics, a gameplay element that warms me greatly. Seriously, I love it. You take one item, mix it with another, and get something–more often than not–greater than the sum of its parts. My feverish appreciation probably all dates back to mixing herbs together for stronger health potions in Resident Evil 2, but if a game has any kind of alchemy element, I’m in. Heck, I bought Atelier Iris 2: The Azoth of Destiny solely on this reasoning, even though its very name scares the life out of me and I’ve not played it yet. In Dragon Quest VIII and Dragon Quest IX, you have a magical pot for all your brewing needs. In the former, it travels with you, riding on the princess-drawn carriage with her goblin father. In the latter, it stays put at the Quester’s Rest inn, which you must visit to do your mixing thing. Either way, you put items together and hope for the best, or you can pick up recipes (or clues) along your journey for killer gear. In VIII, you had to wait a bit for the pot to create the item–maybe about ten or fifteen minutes–which made grinding more bearable, as you battled for XP while waiting to hear that salivating ding that indicated your item was done. They took this away for IX, probably because it was on the DS and meant to be played in short, portable bursts, so waiting was not an option. In Rogue Galaxy, you have two different ways to create new items: Weapon Fusion and the Factory. Basically, all weapons gain XP from battle until they are maxed out, wherein they can then be synthesized along with a similar weapon to create something new. Toady, a strange frog monster, helps with this by swallowing both weapons and spitting out something new; one could argue it is an alchemy pot. However, you don’t really know if something is going to turn out great and just have to chance it, though Toady will also warn you if the results are really negative. For the Factory, it’s more of a puzzle system, where you have to line up machine parts to get it running properly to create a special item from a set of blueprints. For non-Level-5 joints with alchemy-based systems, it’s a mixed bag, with most alchemy systems fairly uninteresting or just bad altogether. Odin Sphere has the player combining two items to generate a new item during gameplay, which is then stored in a “Material” bottle. These bottles can be improved as well by alchemizing two of them together to get a material bottle valued at the multiplicative product of the two original bottles (e.g., Material 2 combined with Material 3 results in a Material 6 bottle). It’s a bit complicated, and I don’t even remember getting to it during my first hour with the game, and I’ve not gone back since. I remember more about various plants you grow during battle than the alchemy, which says a lot, I guess. And then there’s Kingdoms of Amalur: Reckoning, Elder Scrolls V: Skyrim, and Dragon’s Dogma: Dark Arisen, all of which with systems that are nothing more than perfunctory. However, in Ni no Kuni, the alchemy system is unnecessarily clunky. You have two options once you obtain the alchemy pot and its genie master Al-Khemi in Castaway Cove: use a recipe or mix and match. If you have all the right ingredients, simply click “use a recipe” and Al-Khemi with automatically take care of it for you. For mixing and matching, you are either guessing or looking up the select few recipes available in your Wizard’s Tome, a tedious process that involves you backing out of the alchemy menu, into the tome menu, zooming down on the page for alchemy, zooming in more to find the recipe you want, mumble it to yourself a few times so you don’t forget, exiting back out to the main menu, back into the alchemy menu, and trying to create something based off of what you were mumbling to yourself. The sad part of all that? Even if you are successful and create an item, the recipe does not appear in your list of “acquired” recipes; you can only get ones added there from completing errands or earning ’em as the story progresses. That means, even though I successfully made a Fishburger from White Bread (x2), a Dumbflounder, and Crispy Lettuce, I can’t quickly select it again down the line from my recipes list; I have to either remember how to do it from scratch or go back into my tome to remind myself of what is actually in a Fishburger. In short–I really don’t like this. All it means is that I now have to play Ni on Kuni with my laptop next to me open to some recipe wiki page, instead of staying immersed in the game. What a bummer. At this point, I’d rather just have a repeat of Dragon Quest IX‘s system. I died three times last night in Ni no Kuni, and I’m only four hours into the game. To say the uptick in the combat’s difficulty caught me by surprise would absolutely nail it. I mean, yeah, Drippy warned me to avoid fighting monsters in the new area we just got to and simply make a bee-line for Al Mamoon out in the desert, but I didn’t think he actually meant that. Plus, with a Save Stone sorta nearby, I figured I could do a little bit of grinding and heal up for free before moving on. Um, that’s not how things went. First, just like in Dragon Quest VIII and IX, death is not final in Ni no Kuni. There is no perma-death for Oliver and his familiars, and the Game Over screen offers you a choice: return to the main menu to load your last hard save, or lose 10% of your money, called Guilders, and pop back into the game wherever it last auto-saved. For me, that place was upon exiting the Golden Grove. And at this point in the game, I did not have much money, and 10% of not much is, shockingly, not that much, and so I chose to pay the pauper and restart each time. I wonder if you’ll be able to visit a bank later on and safekeep your earnings while you go out and live dangerously. It’s either that or spend a lot of it before you fight in dangerous locations since there’s a good chance you’ll lose a slice or two of your earnings. Let’s talk about the reason behind Oliver and company’s unexpected crumbling: the monsters. Now, sure, I was feeling fairly confident leaving the Golden Grove, as I had just defeated a–well, in my eyes–fairly tough boss called the Gladiataur, which required a lot of switching between familiars and eating of sandwiches for HP regeneration and the heavy use of the Defend button. I can’t say for sure what level the non-boss monsters in the Golden Grove were, but I feel like they were around 8 or 9, which is level with where I had Oliver and two out of three of his familiars. However, once you exit the Golden Grove, you’ll find monsters seemingly around level 12 or 13, and they can completely take out the team in a few hits, especially if symbol alignment is in their favor. The very first monster we ran into killed us. Maybe two or three hits to my level 10 Mitey. Then, heeding the words of the Lord High Lord of the Faeries, I avoided monsters until I couldn’t, as there is a sort of hound-like beast in the desert that is too fast for Oliver to avoid. It killed us fast. The third time saw me trying to take a new path over to Al Mamoon, only to have that hound-like monster stomp us flat. My fourth attempt at making it to the city proved successful, with no encounters at all, but now I’m seemingly stuck in Al Mamoon, and hopefully there are some ways to level up before I have to head back out into the wild. Otherwise, things don’t look good for the future. Sorry, Oliver’s mom. I’m not sure if the appearance of these super strong monsters is deliberate from Level-5/Studio Ghibli or my fault. Should I have leveled Oliver up to 12 or 13 before proceeding on with the story, thus making these monsters more balanced? Though that might have then made the ones in the Golden Grove severely underpowered. And there wasn’t too much left to do in terms of side-quests in Ding Dong Dell or near it (from what I explored), so I felt it was time to move on story-wise. It’s hard to say, really. But now I expect Oliver and his battle-loving critters to succumb to Death’s call many more times; I just hope I won’t have to pay too high of a price to try again.